The War on Islamism - Who is winning? After a good start under Bush after 2001, the West faltered. America chose a naive, appeasing leftist, Barack Obama, for 8 years. The result was a massive increase in terrorism both in the Islamic world and in the West. The surge's defeat of the Iraqi resistance shows that in the long war, if the West keeps its resolve, the jihad will give up, as it did in Algeria in the 1990s and in Israel in the failed Arafat Intifada. If the jihad keeps losing on one front, eventually it stops fighting there. The Iraq jihad was on the ropes in 2008. Unfortunately, America's turn towards Obama and the left in 2008 threw away that victory in Iraq. It showed a clear weakening of western resolve, which encouraged the jihad to keep going. Iraq, which seemed won, got much worse under Obama. The jihad set up a state, and started a genocide that shocked the world. Afghanistan, which seemed won, got much worse under Obama. The Arab Spring brought almost nothing good, and Obama seemed to side with the Islamists, especially in the disgusting Egyptian Revolution. Obama's rhetoric is the rhetoric of American withdrawal and surrender to Islamism. There are a few positives. Obama's welcome and ruthless use of drones decimated Al Qaeda and Taliban leadership. He is not all bad. Iran's nuclear weapons program is the most imminent threat to the West. Iran and Syria for years sponsored the jihad against American and British troops in Iraq, with no consequence. Iran talks openly of its coming genocide of Israel. Bush failed to topple the enemy regimes of Iran and Syria after 2003. Obama failed to support the rebels against Iran when he had a chance in 2009. Now Israel faces Iran alone. Obama also failed to support the rebels against Syria when he had a chance in 2011. Now the rebels are overrun by jihadists. Dictators and regimes come and go, but the appeal of Islamic oppression (sharia) and violence (jihad) is timeless. Globalisation has brought these savage ideas to the western world, and they will not go away. Even if the Middle East is contained, the struggle between Islamists and free people will continue in western cities. The culture war, with abuse and ridicule of Islam, may play the most important role. It may be a century long struggle before jihad and sharia join fascism and communism on the scrapheap of history. It is true that Islamic terror has failed to properly follow up 9/11. There have been no mega-attacks. But the number of small attacks has massively escalated, especially in the Obama years. 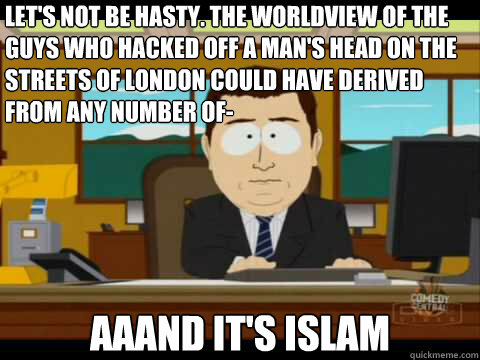 Islamic terror in the West is a constant weekly threat now. No mega-attacks on the West. 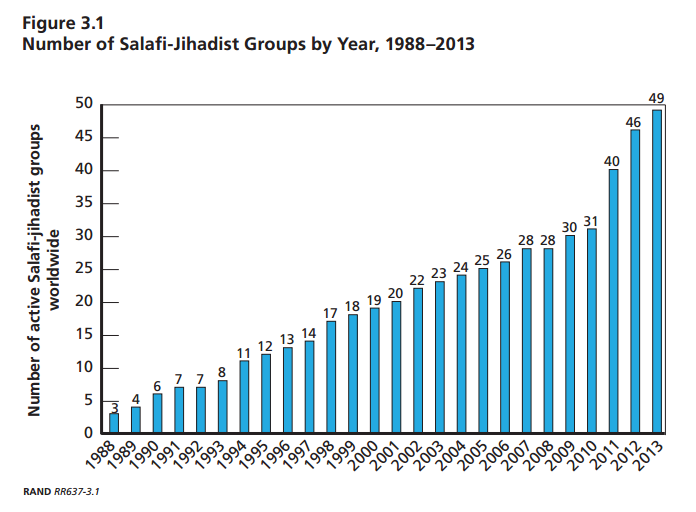 However, smaller Islamic attacks on the West have increased massively in number. Madrid bombings, Mar 2004. Managed to swing an election to the left. Mustafa Nasar captured (the Butcher of Madrid and London). Abdul Hadi al Iraqi captured (the Butcher of London). Salah Abdeslam captured, Mar 2016 (Paris butcher). Mohamed Abrini captured, Apr 2016 (Paris and Brussels butcher). Omar Abdel-Rahman dead, Feb 2017 ("The Blind Sheikh"). Islamic terror has managed no follow up to 9/11. Deposing the Taliban government of Afghanistan was a good day's work. Staying on to try to make Afghanistan a better society was a noble idea, but it now seems impossible. Afghans don't want freedom. They want other things. Sharia has crept back into Afghanistan, making a mockery of the western soldiers who died to build something better. Afghanistan does not deserve any more western soldiers to die for it. Afghanistan liberated from Taliban. Taliban deposed. Al-Qaida bases in Afghanistan destroyed. Afghanistan is not a free society. Afghanistan has somewhat more freedom today, it is true, but not remotely enough to justify the sacrifice in blood and treasure. Obama also seems to have given the jihad new heart. Afghanistan, which seemed won, got much worse under Obama. Mullah Omar dead, Apr 2013 (Taliban leader). He never faced justice for his crimes. Akhtar Mansour killed, May 2016 (Taliban leader). Abdul Ghani Baradar captured (Taliban de facto leader). Unfortunately Pakistan later released him. Mullah Bakht Mohammed captured (Taliban). Mullah Akhtar Mohammad Osmani killed, Dec 2006 (Taliban). Mullah Obaidullah captured (Taliban defense minister). Abdullah Mehsud killed, July 2007 (Taliban). Mullah Dadullah killed, May 2007 (Afghan Taliban leader). Colonel Imam killed, Jan 2011 (Founder of the Taliban). Awal Gul dies, Feb 2011 (Taliban). Badaruddin Haqqani reported killed, Aug 2012 (Haqqani Network). No more Western soldiers should die for this state. This front has gone well. Al Qaeda have been decimated by drone attacks. They have failed to mount decent attacks against the West, while the West slaughters them relentlessly. Obama's ruthless use of drones has decimated Al Qaeda and Taliban leadership. Obama is not all bad. Saad bin Laden killed, July 2009. Ramzi Binalshibh captured (9/11 planner). Sayeed al-Masri killed, May 2010 (head of al-Qaida in Afghanistan). Atiyah Abd al-Rahman killed, Aug 2011 (Al Qaeda no.2). Abu Yahya al-Libi killed, June 2012 (Al Qaeda no.2). 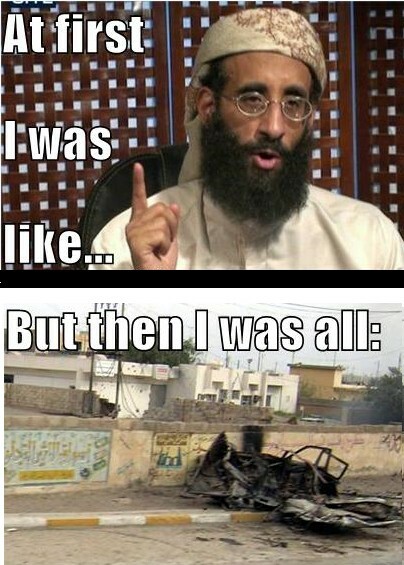 Anwar al-Awlaki killed, Sept 2011 (no.1 English-language leader of the global jihad). Samir Khan killed, Sept 2011 (no.1 English-language media figure in the global jihad). Adam Gadahn killed, Jan 2015 (English-language Al Qaeda spokesman). Sulaiman Abu Ghaith captured, Mar 2013 (top Al-Qaida spokesman). Aafia Siddiqui jailed ("Lady Al Qaeda"). Sabar Lal Melma killed, Sept 2011 (former Guantanamo prisoner). Ahmed Khadr killed, Oct 2003 (Al Qaeda). Abu Hamza Rabia killed, Nov 2005 (Al Qaeda). Mohammed Jamal Khalifa killed, Jan 2007 (Al Qaeda). Abu Laith al-Libi killed, Jan 2008 (Al Qaeda). Midhat Mursi killed, July 2008 (Al Qaeda). Khalid Habib killed, Oct 2008 (Al Qaeda). Rashid Rauf killed, Nov 2008 (Al Qaeda). Usama al-Kini killed, Jan 2009 (Al Qaeda). Najmiddin Jalolov killed, Sept 2009 (Al Qaeda). Saleh al-Somali killed, Dec 2009 (Al Qaeda). Atiyah Abd al-Rahman killed, Oct 2010 (Al Qaeda). Nasir al-Wuhayshi apparently killed, Dec 2010 (Al Qaeda). Ilyas Kashmiri killed, June 2011 (Al Qaeda). Abu Zubaydah captured (Al Qaeda). Abu Faraj al-Libbi captured (Al Qaeda). Muhammad Rahim captured (Al Qaeda). Hassan Ghul captured (Al Qaeda). Younis Al Mauritania captured (Al Qaeda). Abu Ali al-Harithi killed, Nov 2002 (USS Cole bomber). Tawfiq bin Attash captured (USS Cole bomber). Abd al-Rahim al-Nashiri captured (USS Cole bomber). Fahd al-Quso killed, May 2012 (USS Cole bombing). Jamal Ahmad Mohammad Al Badawi killed, Jan 2019 (USS Cole bombing). Said Ali al-Shihri killed, Jan 2013 (AQAP no.2). Sajida Mubarak Atrous al-Rishawi executed, Feb 2015 (female, Jordan bomber). Muhsin al-Fadhli killed, July 2015 (Al Qaeda in Syria). Fazul Abdullah Mohammed killed, June 2011 (Al-Qaeda no.1 in East Africa). Mohammed Atef killed, Nov 2001 (1998 U.S. Embassy bombings). Mushin Musa Matwalli Atwah killed, Apr 2006 (1998 U.S. Embassy bombings). Ahmed Ghailani captured (1998 U.S. Embassy bombings). Anas al-Liby captured, Oct 2013 (1998 U.S. Embassy bombings). Saleh Ali Saleh Nabhan killed, Sept 2009 (Al Qaeda in East Africa). Abdelhamid Abou Zeid killed, Feb 2013 (Al-Qaeda in the Islamic Maghreb). Mokhtar Belmokhtar reported dead multiple times, latest Oct 2015 (Algerian Civil War and Al-Qaeda butcher). Al Qaeda magazine, Inspire, Oct 2010, admits that Bush hammered them after 9/11: "It is no longer possible to operate by the methods of the old model, through the �secret regional-hierarchical� organisations, especially after the September 11 events and the onset of the American campaigns, where the great majority of the existing secret organisations were destroyed." Obama continues to hammer them with drones. The Jawa Report on the demise of Anwar al-Awlaki in 2011. Deposing the democidal monster Saddam was a good day's work. Staying on to try to make Iraq a better society was a noble idea, but it now seems impossible. Iraqis don't want freedom. They want other things. Accepting that disappointment, Iraq could at least have been kept as a friendly, unfree client state with US bases. But Obama threw even that away. Iraq liberated. Saddam deposed. Greatest military victory of the West since the end of World War Two in 1945. Iraq was given a great gift by the West - the chance of a better society. But the chance was squandered in jihad against the infidel troops and a maniac sectarian war. The satanic Iraqi "resistance" plumbed depths of evil rarely seen in the modern age. The surge brought a great victory over Iraqi resistance. But Iraq is not a free society. It was a noble war, but Iraq was not worthy of the sacrifices made for it by the allies. Tariq Aziz captured, dies in prison. Saddam's Defence Minister captured, sentenced to death. Saddam's Interior Minister captured, sentenced to death. Saddam's secret service head captured, sentenced to death. Saddam's chief of staff of the armed forces dies in prison. Top Saddam general and Ba'athist insurgency leader Izzat Ibrahim al-Douri killed, Apr 2015. Al-Zarqawi killed, June 2006 (head of Al-Qaeda in Iraq). Abu Ayyub al-Masri killed, Apr 2010 (head of Al-Qaeda in Iraq). Abu Omar al-Baghdadi killed, Apr 2010 (head of Islamic State of Iraq). Abu Dua captured, Dec 2012 (head of Al-Qaeda in Iraq). Abu Qaswarah killed, Oct 2008 (second in command of Al-Qaeda in Iraq). Khaled al-Mashhadani captured (Al-Qaeda in Iraq). Abu al-Tunisi killed, Sept 2007 (Al-Qaeda in Iraq). Abu Rami killed, Oct 2008 (Al-Qaeda in Iraq). Abu Muhammad Asem al-Maqdisi arrested, Sept 2010 (Al-Zarqawi's mentor). Al-Nasser Lideen Allah Abu Suleiman killed, Feb 2011 (leader of Al-Qaeda in Iraq). The surge brought victory over Iraqi resistance. Unfortunately, Obama then threw victory in Iraq away. US leaves. No US bases. No US power. Iran, not US, has influence. Shia oppression. Sunni jihad returns. The jihad rampant in Iraq, 2013 on. Abu Muslim al-Turkmani killed, Nov 2014 (ISIS no.2). Abu Ala al-Afri killed, May 2015 (ISIS no.2). Abu Mohammad al-Adnani killed, Aug 2016 (ISIS no.2). Abu Omar al-Shishani reported killed, July 2016 (ISIS "minister of defence"). Junaid Hussain killed, Aug 2015 (British ISIS hacker). Denis Cuspert killed, Jan 2018 ("Deso Dogg", ISIS rapper). "Jihadi John" killed, Nov 2015 (ISIS beheader). All four of the British ISIS "Beatles" are now captured or killed. Abu Nabil killed, Nov 2015 (leader of ISIS in Libya). Abu Abdulrahman al-Bilawi killed, June 2014 (ISIS). Abu Sayyaf killed, May 2015 (ISIS). Abu Waheeb killed, May 2016 (ISIS). Khalid Kelly killed, Nov 2016 (Irish ISIS fighter). Turki al-Binali killed, May 2017 (ISIS cleric). Freedom House still lists Iraq as "Not Free" in 2018, 15 years after Saddam was deposed. 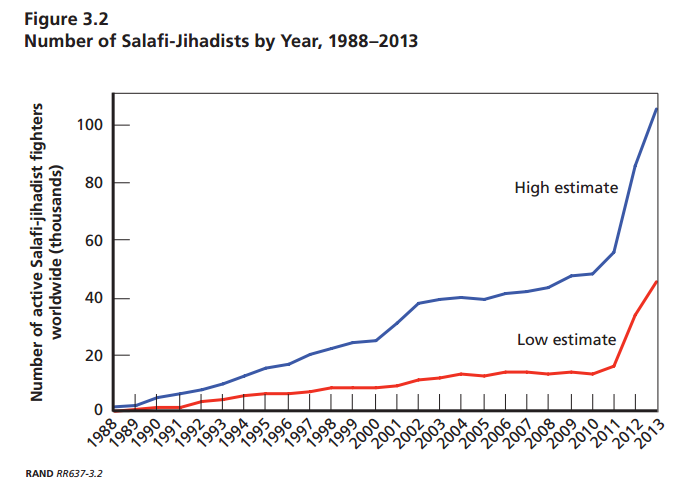 The jihad has been killing across half the world for 1,400 years. It is hardly going to stop now. The jihadists slaughter tens of thousands in Pakistan. Pakistan has of course spent decades encouraging such jihad. The jihadists want a sharia state. Pakistan is already a sharia state. But you can never be sharia enough. Baitullah Mehsud killed, Aug 2009 (leader of Pakistan Taliban). Hakimullah Mehsud killed, Nov 2013 (leader of Pakistan Taliban). Wali-ur-Rehman killed, May 2013 (no.2 in Pakistan Taliban). The other Mullah Dadullah killed, Aug 2012 (Pakistan Taliban). Muslim Khan captured (Pakistan Taliban). Qari Hussain killed, Oct 2010 (Pakistan Taliban). Mullah Nazir killed, Jan 2013 (Pakistan Taliban). Nek Muhammad killed, June 2004 (Pakistan Islamofascist). Ajmal Kasab executed, Nov 2012 (Butcher of Mumbai). Sayed Zabiuddin captured, June 2012 (Butcher of Mumbai). Afzal Guru executed, Feb 2013 (Pakistani terrorist). Jihad in Mali. Jihad takes over much of Mali. But Mali is later liberated. Jihad in Somalia. 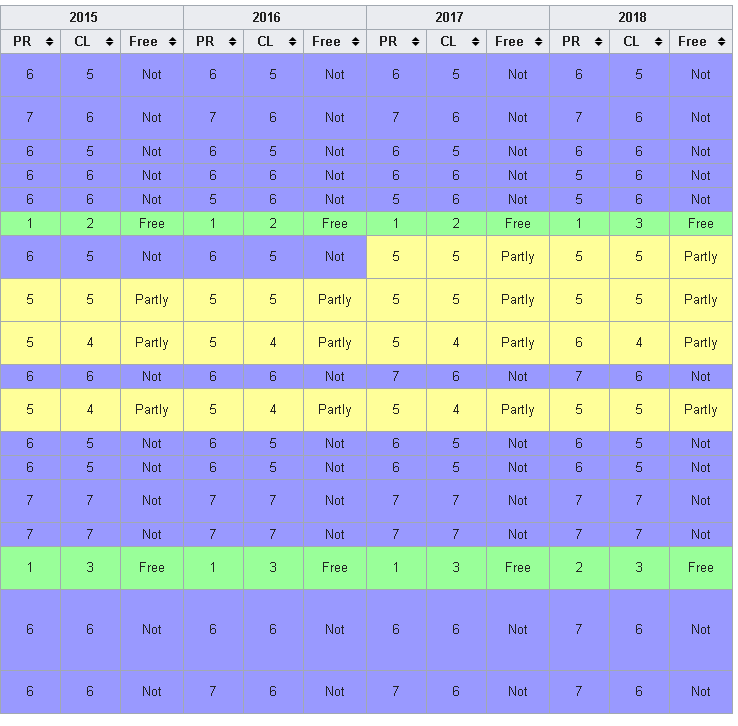 Victories and defeats. Abu Talha al Sudani killed, 2007 (Al Qaeda in Somalia). Aden Hashi Farah killed, May 2008 (Somali Islamofascist). Fuad Mohamed Qalaf reported killed, May 2011 (Somali Islamofascist). Aboud Rogo killed, Aug 2012 (Al-Shabaab Islamofascist). Abu Mansoor Al-Amriki reported killed, Sept 2013 (American traitor in East Africa). Jihad in Nigeria. Jihadists slaughter thousands. Mohammed Yusuf killed, July 2009 (Boko Haram founder). Abubakar Shekau possibly killed, Aug 2013 (Boko Haram leader). Abu Qaqa II killed in internal dispute, April 2012 (Boko Haram). Shamil Basayev killed, July 2006 (the Butcher of Beslan). Supyan Abdullayev killed, Mar 2011 (Chechen Islamist). Dokka Umarov possibly killed, Mar 2011 (Chechen Islamist). Tohir Yo�ldosh killed, Aug 2009 (Islamic Movement of Uzbekistan). Noordin Mohammed Top killed, Sept 2009 (Butcher of Bali). Hambali captured (Butcher of Bali). Dulmatin killed, Mar 2010 (Butcher of Bali). Azahari bin Husin killed, Nov 2005 (Butcher of Bali). Umar Patek captured (Butcher of Bali). Bali bombers executed, Nov 2008. Enal Tao killed, Apr 2010 (beheader of Christian schoolgirls). Ahmed Santos captured (Philippine Islamofascist). Zulkifli bin Hir killed, Feb 2012 (Philippine Islamofascist). Umbra Jumdail killed, Feb 2012 (Philippine Islamofascist). thereligionofpeace.com tracks all Islamic terror attacks since 9/11. 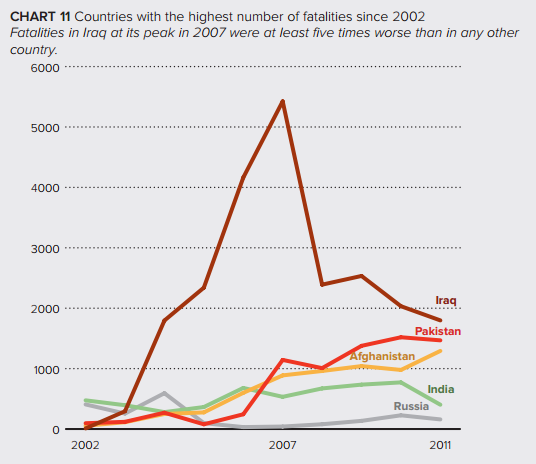 Deaths per year from terrorist attacks 2002-2011 in the five worst countries. The cause of the terror in all five: Islam. This index is by a left-wing group that shows us a graph of all terror (Islamic and non-Islamic) over time, but refuses to show us a graph of all Islamic terror over time. The above is as close as we can get to a graph of Islamic terror. The jihad is the great, modern, global, post-communist movement of tyranny, terror, oppression and democide. It fills a great need for an anti-freedom movement, after the end of communism. It is still growing. It got a huge boost with the election of Obama in 2008. Charts from RAND report, June 2014. The neo-con dream after 9/11 was that Muslims would embrace freedom. 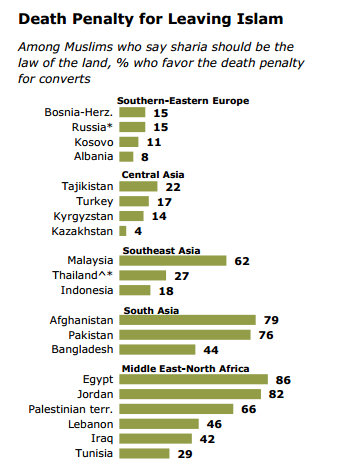 Afghanistan, Iraq and the Arab Spring show the reality - that most Muslims do not want freedom. They want other things. The Arab Spring brings only disappointment. Tunisia gets rid of dictator. But then elects Islamists. Egypt gets rid of dictator. But then elects the Muslim Brotherhood. They are in turn deposed. But there is little evidence that the Egyptian people have changed. Libya gets rid of the dictator Gaddafi. Gaddafi is killed. But there is little evidence that a liberal state will emerge. Saif al-Islam Gaddafi sentenced to death. Lebanon revolution. Syria leaves. But Hezbollah get into government. Syrian civil war sees enemies of the West (Assad, Hezbollah, Iran) versus enemies of the West (Sunni jihadists, Al Qaeda). Obama failed to support the rebels against Syria when he had a chance in 2011. Sunni-Shia regional war over Syria might be a good thing for the West and Israel. Dawoud Rajiha killed, July 2012 (Syrian Minister of Defense). Assef Shawkat killed, July 2012 (Syrian deputy Minister of Defense). Hasan Turkmani killed, July 2012 (Syrian assistant vice president). 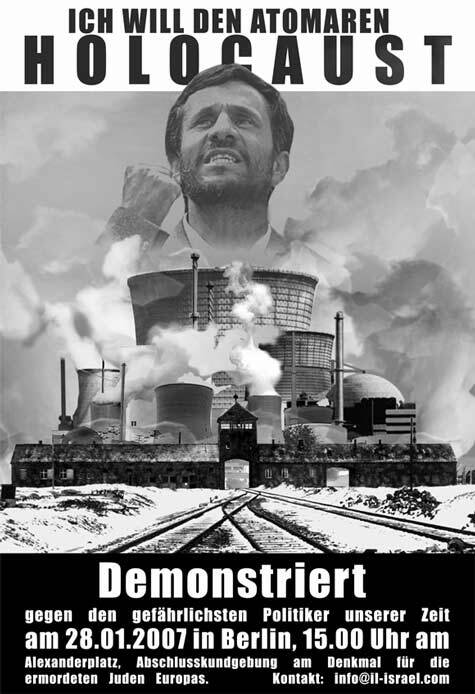 Mohammed al-Bouti killed, Mar 2013 (Syrian pro-regime Islamofascist). Abdul Qader Saleh killed, Nov 2013 (Syrian jihadi rebel). Hassan Aboud killed, Sept 2014 (Syrian jihadi rebel). Zahran Alloush killed, Dec 2015 (Syrian jihadi rebel). Darfur genocide carried out by Sudan Islamist government. South Sudan created July 2011 as a new country. Hassan al Turabi dies, Mar 2016 (top Sudanese Islamofascist). The appalling opinions of the Islamic world. The problem with reforming the Islamic world is that most Muslims do not want to be free. They want sharia oppression, not freedom. Egyptians get rid of the dictator Mubarak. And then elect Muslim Brotherhood President Mohamed Morsi, who says the Jews are descendants of apes and pigs. Under Bush, North Korea got nukes. Under Obama, Iran is building nukes. Only Israel can stop Iran now. North Korea explodes nuclear bomb, 2006. The Pakistan, North Korea and Iran nuclear weapons programs are ultimately the means by which Islamist terrorists will get nukes and set them off in western cities. Obama failed to support the rebels against Iran when he had a chance in 2009. US-Iran agreement on Iranian nuclear weapons, Nov 2013. Obama abandons any serious attempt to stop Iranian nukes. Obama abandons Israel. Israel now stands alone against Iran. Saudi Arabia will want nukes if Iran has them. Gaddafi's Libya abandons WMD program. The regime later ends anyway. Pakistan nuclear proliferation shut down. Ardeshir Hosseinpour dies, Jan 2007 (Iranian nuclear weapons scientist). Masoud Alimohammadi killed, Jan 2010 (Iranian nuclear weapons scientist). Majid Shahriari killed, Nov 2010 (Iranian nuclear weapons scientist). Darioush Rezaeinejad killed, July 2011 (Iranian nuclear weapons scientist). Hassan Moghaddam killed, Nov 2011 (Iranian missile program). Asked about the blast, Israel's Defense Minister said: "May there be more like it." Mostafa Ahmadi-Roshan killed, Jan 2012 (Iranian nuclear weapons scientist). Only Israel can stop Iranian nukes now. The Israel front of the jihad is quiet. A combination of defence (the wall) and offence (air strikes, incursions) ended Arafat's disgusting intifada. The Palestinians lost. That monster Arafat died. Fatah have gone quiet since. Israel should be in no hurry to reach any new settlement. The Palestinian jihad is suppressed and under control. Arafat dies, Nov 2004. A monster and a butcher. If only he had died in 1985. 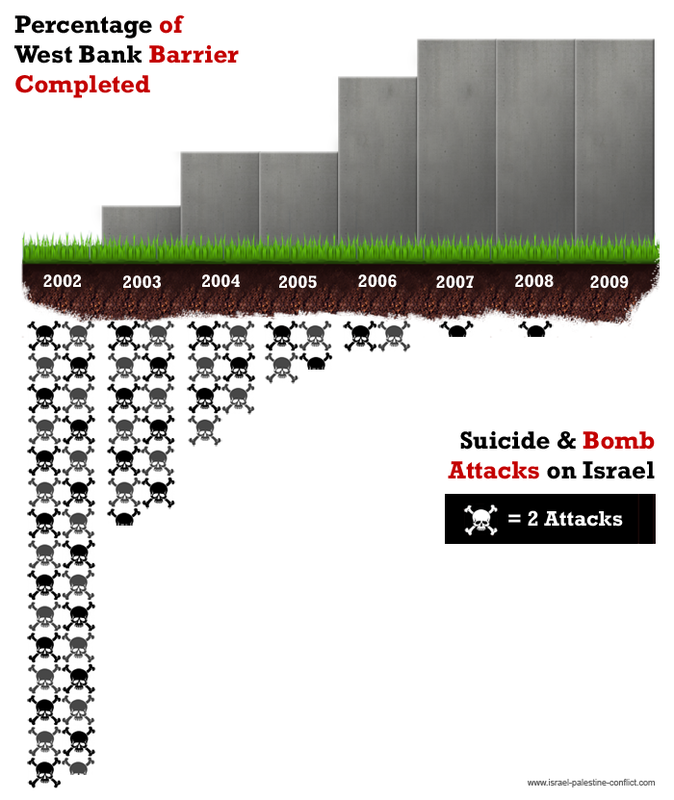 Israeli wall built, saving countless lives. Palestinian intifada defeated. Fatah goes quiet. Gaza pull-out, 2005. Jews evicted for no reason. Terror state set up. Gaza elects Hamas. They want to be poor. They want to be bombed by Israel. Israel would like to forget all about Gaza, but Hamas won't stop attacking them. Israel has to keep bombing Hamas. It would be nice if Hamas stopped this some day. Yassin killed, Mar 2004 (leader of Hamas). Rantissi killed, Apr 2004 (leader of Hamas). Salah Shahade killed, July 2002 (Hamas). Nizar Rayan killed, Jan 2009 (Hamas). Said Seyam killed, Jan 2009 (Hamas). Mahmoud Al Mabhouh killed, Jan 2010 (Hamas). Issa Batran killed, July 2010 (Hamas). Ahmed Jabari killed, Nov 2012 (Hamas). Raed al Atar killed, Aug 2014 (Hamas). Mohammed Deif possibly killed, Aug 2014 (Hamas). Abu Daoud dies, July 2010 (Fatah, Munich massacre). Kamal Medhat killed, Mar 2009 (Fatah). Abu Abbas dies, Mar 2004 (Palestine Liberation Front, Achille Lauro). Ahmad Sa'adat captured, Mar 2006 (PFLP). George Habash dies, Jan 2008 (founder of PFLP). Abdul-Latif Moussa killed, Aug 2009 (Gaza Islamofascist). Lebanon war, 2006. Israel hammers Hezbollah and they go quiet for a while. Imad Mughniyah killed, Feb 2008 (Hezbollah butcher of Americans and Jews). Ayatollah Fadlallah dies, July 2010 (spiritual mentor of Hezbollah). Mohammed Ali Hammadi killed, June 2010 (Hezbollah Flight 847 killer). Hassan al-Laqqis killed, Dec 2013 (Hezbollah). Samir Kuntar killed, Dec 2015. Mustafa Badreddine killed, May 2016 (Hezbollah). Abu Nidal killed, Aug 2002 (Rome and Vienna airport attacks). Jamal Saeed Abdul Rahim killed, Jan 2010 (Pan Am Flight 73 killer). Arafat's sick intifada is defeated. Islam continues to grow in the West. The Western left, foolishly, continues to indulge it rather than treat it with the ridicule they reserve for Christianity. Reactionary religious law is creeping back all over the West, under the guide of "sensitivity" to primitive third world culture. Rachid Ramda extradited to France (1995 French bombings). Abu Hamza extradited to US. RevolutionMuslim fascists jailed in USA. Ahmad Abu Laban dies, Feb 2007 (Danish Islamist who incited the Muhammed cartoons killings). Beverly Giesbrecht dies, announced Nov 2010 (Canadian Islamofascist). Ezra Levant is hauled in front of a Canadian court enforcing sharia law on speech. This is the one thing that will save us all. That Islam is criticised, ridiculed, mocked, satirised and picked apart in the non-stop, worldwide torrent of criticism and disrespect on the Internet. This abuse really started in 2001. And it will change the world. Never before in the history of Islam did it have to deal with the endless abuse and criticism that it has to deal with now. Any young Muslim growing up today is only a few clicks away from every sort of argument against Islam - from the scholarly to the comical. It cannot be stopped, and anyone who thinks this won't change Islam is being very short-sighted. So at the same time that the western left is pandering to the most reactionary Islamist immigrants, the Great Islamic Apostasy is actually beginning. The left has got it wrong again. The Internet does not obey the left, and it will criticise and mock Islam forever. And if this makes Islam collapse like communism, so much the better. Islam annoys the West. 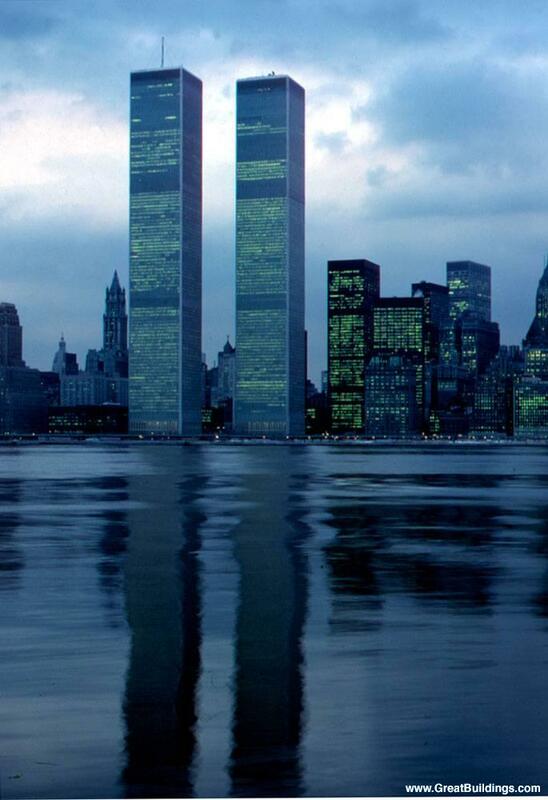 The West woke up to Islam on 9/11. It will never leave it alone now. Get used to criticism and blasphemy. It won't ever go away now. Islam, not the West, is going to change. 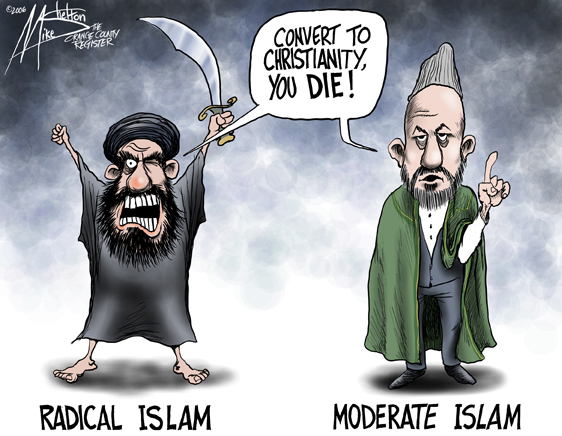 Islam has lasted 1,400 years because it has never had to face criticism or mockery. All critics and satirists were killed. That era is now over. Can Islam survive the next 50 years of Internet memes? 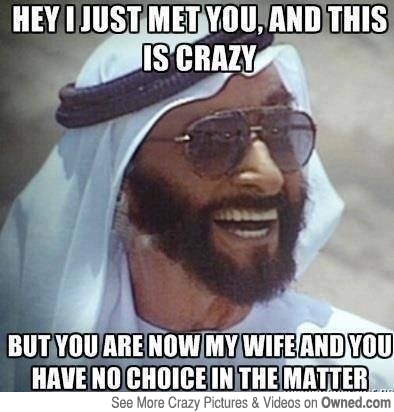 This meme refers to the lyrics of "Call Me Maybe". 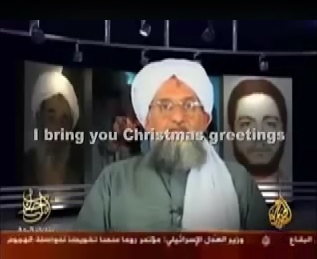 A spoof in which, after reading the Koran and the New Testament, al-Zawahiri loses his faith and becomes a Christian. "What Islam Fears - Laughter". An atheist reacts to a Muslim crackpot talking about the Punishment of the Grave. Islamic religious crackpot: "And that scorpion is so much poisonous that .. there is a .. This is a true story by the way." Atheist [laughing]: "Are you sure about all this?" Imagine if the West had a Reagan as a leader. A leader that would try to bring down the Iranian and Syrian regimes. A leader that would endlessly attack Iran and Syria in unexpected ways, cause them great expenditure, start rebellions in their countries and mount up endless problems for them, in the way that Reagan caused endless trouble for the Soviets. The Iranian and Syrian regimes would be gone by now if the American people had elected such a leader instead of the hesitant Bush and the useless Obama. Imagine if the West had a leader who stood up for the values of the Western Enlightenment, and defended our freedoms as superior to any society based on religion. Imagine a leader that vowed that no western soldier will ever die for a sharia state, that no western aid will ever go to a sharia state. That only secular democracy is acceptable. The West could do so much more in this war. The West could win, if it really tries. Victory is possible, if we ever get a Reagan. Al Qaeda offer a truce, Oct 2004. The correct response, of course, is to finish them off. Al Qaeda again offer a truce, Jan 2006. The correct response is to escalate. To demoralise them, humiliate them, and make them lose all hope. They say: "The delay in similar operations happening in America has not been because of failure to break through your security measures." Yeah, sure. As Richard Fernandez says: "The enemy is even now dying at our feet, where we should kick him and kick him again." Angels and Intelligence Estimates by Charles Krauthammer, October 6, 2006 - Al-Qaeda says 4,000 of its recruits have been killed in Iraq since liberation in 2003. Yet at the same time there has been not a single large terror attack in the US. In fact, in 5 years now there has been no major attack in the US. "It is clear that one of the reasons we have gone an astonishing five years without a second attack on the American homeland is that the most dedicated and virulent jihadists have gone to Iraq to fight us, as was said during World War I, 'over there'." I wouldn't want to give the jihadi scum any ideas, but: Maybe the jihadis are wasting their time in Iraq. Maybe they have allowed themselves be distracted by a pointless war (Iraqis hate them and will fight them forever). Maybe the jihad should have ignored Iraq and concentrated on following up 9/11. All that jihadi energy wasted. All those young jihadi lives lost - for nothing. Maybe the enemy is just being stupid, like Hitler invading the Soviet Union. Let's hope so. "We have taken apart two-thirds of al-Qaeda and forced it to spend its youth and treasure in Iraq, not here. At the same time, al-Qaeda finds itself in the unenviable position of fighting Iraqi Muslims to stop democracy. Who accomplished that? The diabolic George Bush? ... Genocide existed before we invaded Saddam's Iraq, a regime without any chance of reform. Now terrorists like moths to a searing flame are flocking there and in most cases being incinerated. They show their true colors in trying to destroy a government voted in by the people. When rats flock to a tray of D-Con, few say that the poison created rats out of thin air and made the problem worse." "Right now about the only place in the world - not in Egypt, Pakistan, or Saudi Arabia - where large number of Muslim fanatics and terrorists are being killed is in Afghanistan and, yes, Iraq. I am not of the persuasion that D-Con trays create, rather than merely draw out, rats, although the results are often messy and smelly, and reveal a seemingly endless supply of such pests that we scarcely knew were deep within our walls." On the fact that no second 9/11 has yet taken place: "Tragically few will credit the US military in the next decade should we not have another 9-11 attack or something far worse. We know Islamic fascists and their autocratic supporters wished such slaughter; their only problem, once the US military took the offensive, was an increasing inability to carry it out. It is my belief that our soldiers in both Afghanistan and Iraq have saved tens of thousands of American lives, by routing the Taliban and scattering al Qaeda, and by removing Saddam Hussein and changing the entire landscape of the Middle East"
"Five years after 9/11, Osama bin Laden waits in vain for a Muslim 'awakening'. The lure of the West is just too powerful a force." "Yes, there is a small, if growing, number of Muslims who are attracted to 'al-Qaedaism' in its largest sense. But the truth is that out of a total of 1.6 billion Muslims, very few have joined terrorist organisations. In countries that have suffered violence, such as Saudi Arabia, Jordan and Iraq, there has been a strong counter-reaction to the atrocities of recent years. The number of young men attracted by violence in the UK is larger than it was a decade ago, but is still statistically insignificant. If bin Laden's 'awakening' has started, it is taking a long time." In a century's time, Islamism will be gone. And the West will still be here. "Will these books appear to have been unduly alarmist in half a century's time? I certainly hope so, and indeed suspect that it might be so. We have had many perils and predicted apocalypses before. Islamism, and indeed (in my belief) the whole of Islam, is potentially very vulnerable to the corrosive effect of the intellectual acid-bath of rational criticism."